This volume, titled: A very fruteful and pleasant booke called The instruction of a christen woman, was designed for the purpose of educating a girl or young woman on her role in society. First written in Latin in the 1520s by the Spanish humanist Juan Luis Vives, this English edition dates from 1557, and contains chapters concerning a woman’s place in the universe, her spiritual development and, most notably, her education, which the book suggested should be provided regardless of social standing or ability. This month’s image is the volume’s handsome frontispiece, which depicts a classical portico entwined with foliage, flanked by two forms and a number of classical figures and assorted mythical creatures. The choice of this design by the printer Henry Wykes might relate to its symbolic depiction of a young female figure who forms the right-hand pillar of the portico, echoing Vives’ lengthy discourses on a woman’s entrance into the world contained in the text. 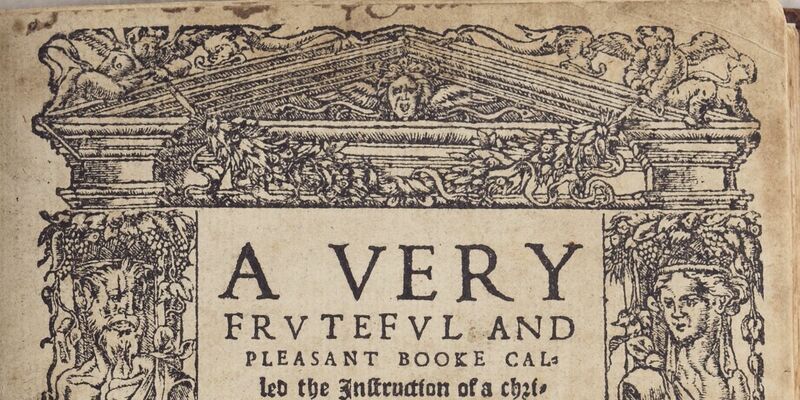 It is also the case that frontispieces such as these were ‘stock images’ employed by printers on numerous different texts emerging from their presses; the use of one of these for this volume points to its mass appeal and relative cheapness. An inscription within the volume claims that Vives was invited by Cardinal Wolsey to serve ‘as An Orator in his New Collidge at Oxford’, and it was while in Oxford that Vives was commissioned by Wolsey to write this text as an educational volume for Princess Mary Tudor, daughter of Catherine of Aragon and Henry VIII and future Queen of England. Instructions such as: ‘Noue if thou canste not els be maried, it is better never to marie, than to offende Christ for it’, certainly seem to have struck a chord with the Princess Mary, not to mention with her half-sister Elizabeth. Vives was a leading humanist of the age and was a leading advocate of educational reform, especially for woman whose access to education was almost non-existent outside of the highest echelons of society. Contemporaries such as Erasmus, Thomas More and his daughter Margaret Roper all praised Vives’ promotion of universal education for women and it was during this century that a larger slice of society started to recognise the benefits of educating their daughters; texts such as this one are symptomatic of that evolution. On the most basic level, gentry and merchant families began to consider an educated wife as a benefit, especially if she undertook responsibilities associated with the running of the family business, and there are many examples of merchant businesses being bequeathed to widows in wills. Such ideals are far removed from this text’s initial Royal purpose, but the contents of this volume proved to be so truly ‘catholic’ or universal that they were ‘tourned into Englishe by Rycharde Hyrde’ with the blessing of Catherine of Aragon, with the first English edition appearing in 1529. Just like Vives, Hyrde was known to have worked alongside Thomas More and Margaret Roper in advocating female education and this translation proved to be one of the most successful volumes on the subject throughout the early modern period and beyond, going through countless editions. It success was such that the contents of Artemas Muzzey’s The English Maiden: Her Moral and Domestic Duties, published almost three centuries later in 1844, are almost identical to that of Hyrde’s translation. Such a similitude underlines both the stagnant state of 19th century education and also the lingering impact of Vives’ and Hyrde’s labours.